A clear, consistent message can be the difference between a phenomenally successful marketing campaign and an utter waste of time and money. If you, as a marketer, have not defined your message clearly, how likely is it that your target audiences will get the message you want them to hear? Answer: Not very likely. With IMC campaigns bringing together multiple communication tools and touch points, the impact of a consistent, effective message is compounded when it reaches the people you’re targeting again and again through different channels. Conversely, in the absence of a clear message, a campaign results in miss after miss after miss in terms of getting your message to your target audience—and it means wasted effort and resources. In marketing, the term “messaging” refers to how an organization talks about itself and the value it provides. Related to positioning, messaging is an approved set of key points or messages an organization uses to communicate about something with a target audience. Messaging translates a positioning statement into a set of convincing “key message” statements. Marketers use these statements to develop materials for marketing communications such as ad slogans, advertising copy, social media posts, press releases, presentation scripts, and so forth. Messaging documents are a blueprint for what all the other materials–and people–should communicate. Organizations may create messaging for different purposes. Corporate messaging communicates about the purpose and value a company provides to the market. Brand messaging focuses on how and what to communicate about a company, product, or service brand. Product messaging expresses key selling points about a product. Crisis messaging outlines talking points for how an organization communicates about an unfortunate development, such as a service interruption or a public scandal. Messaging ensures that everyone in an organization who needs to communicate something with the market can do it with a common set of messages and a common understanding of what the market should hear from them. While messaging is usually created by the marketing team, it may be used by individuals and teams across a company, from executive leaders to product managers, sales representatives and other groups, in addition to the marketing team itself. Messaging is an essential ingredient for a successful marketing campaign. A campaign may use existing messaging if its goal is tied to a topic for which messaging has already been developed. For example, existing brand messaging might be used to develop a brand-awareness campaign. If no suitable messaging exists, marketers may need to develop key messages expressly for a campaign. Articulate clearly and concisely what you need to communicate about: e.g., what you stand for, why you are different, what value you offer, what problems you solve, etc. The message content, as well as the voice, tone, and style of the message, may vary widely, depending on the organization’s identity and what it wants to accomplish with the communication. All of these elements factor into the key messages and the creation of marketing communication artifacts based on the messaging. Start with the Basics: What, Who, Why? Message development starts with doing your homework about what the organization needs to accomplish. Revisit the company goals, objectives, and the marketing strategy to confirm the outcomes that the messaging is designed to help achieve. Consult any related positioning statements the organization has developed, because positioning lays out the foundation for what the organization wants to communicate. As you develop messaging, it’s also a good idea to review any brand-platform content, since that content can help reinforce the organization’s identity, voice, and values. Next, confirm the audience(s) for the messaging: who are the target segments and stakeholders you need to reach? Some messaging documents outline different sets of key messages for different audiences, depending on what points are most important or convincing for the audience. For example, when company leaders must communicate publicly about poor quarterly earnings, they develop one set of key messages for investors, another set of key messages for employees, and a third set for customers. All these messages are related to one another, but the most important messages for an investor to hear may be different from what employees need to hear. Identify key words and ideas you want to associate with your organization, product, service, or offering. These words and phrases may figure prominently in the messaging you develop, to help it stand out and differentiate your organization. Also, conduct a competitive messaging analysis to capture what key messages, words, and concepts other organizations are using. Your messaging should avoid sounding like everybody else. Concise: Key message statements should be clear and concise, ideally just one sentence long–but not a long, run-on sentence. Simple: Key messages should use language that is easy for target audiences to understand. You should avoid acronyms, jargon, and flowery or bureaucratic-sounding language. Strategic: Key messages should differentiate your organization and what you stand for, while articulating the value proposition or key benefits you offer. Convincing: Messaging should include believable, meaningful information that creates a sense of urgency and stimulates action. Message wording should be decisive and active, rather than passive. Relevant: Key messages should matter to the audience; they should communicate useful, relevant information that the audience finds appealing not only on a logical or rational level but also on an emotional level. Memorable: Key messages should stick in the mind, so the impression they make is easy to recall. Tailored: Messaging must communicate effectively with intended target audiences. This means the messaging should reflect the target audience’s unique needs, priorities, issues, terminology, relationship to the organization, and other distinguishing factors that might help the messaging better communicate with that audience. A tip: Don’t worry too much about word-smithing as you develop a first draft of key messages. Get your initial thinking down on paper quickly, and then go back to check against the criteria above as you refine the wording. Remember, you only need a handful of key messages—just one to three well-crafted statements—so don’t slave over trying to fill an entire page. Once you have drafted an initial set of key messages, it is helpful to prioritize and organize them into a framework that helps you tell a coherent story. Marketers use a variety of different frameworks for this purpose. A simple, standard messaging framework is illustrated in the figure below. This framework includes key messaging components introduced elsewhere in this course: the brand promise, positioning statement, and target audience. 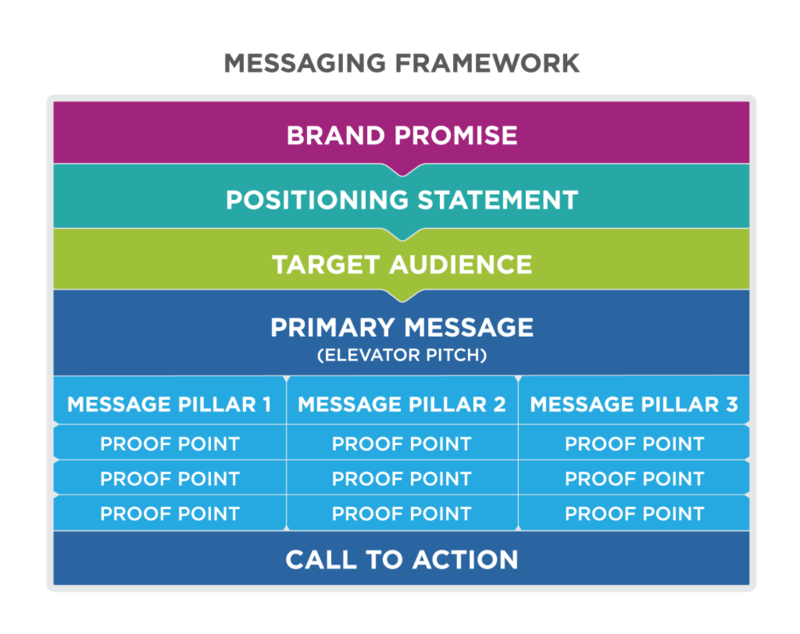 By bringing these elements into the messaging document, it is easy to spot disconnects or confirm alignment between the day-to-day talking points (the primary message and message pillars), the audience, and what the organization stands for (as expressed in the brand promise and positioning statement). He’s heard a few pitches in his day . . . The primary message is sometimes referred to as an elevator pitch. Think of it as the one to three sentences you would say to a member of your target audience if you had just thirty seconds with them in an elevator. In that short time, you need to get across the core ideas. As you review the initial key messages you drafted, identify the most important ideas. Refine them into a concise statement that expresses your primary message. To support this primary message, identify one to three message pillars that further substantiate the primary message or elevator pitch. When the elevator pitch is expressing a value proposition, the message pillars are usually the key benefits delivered by the value proposition. When the elevator pitch is arguing a position, the message pillars are the key reasons the target audience should believe what is being argued. 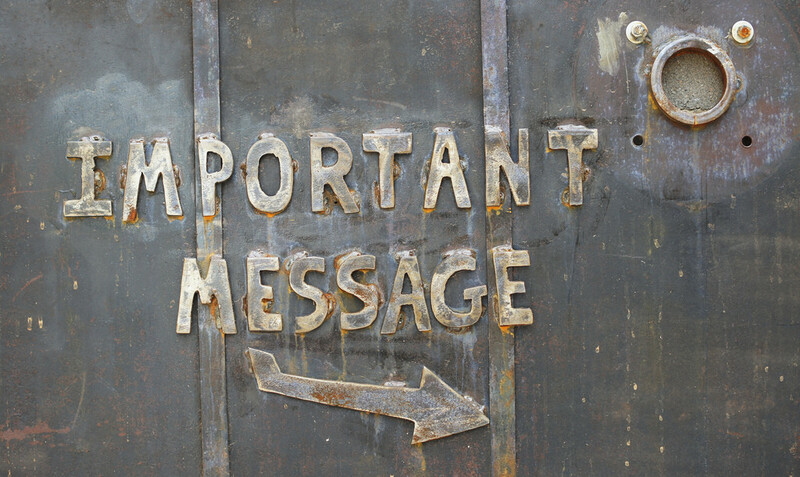 To identify your message pillars, review the initial messages you drafted. It is likely that your initial work captures some of those pillars or arguments that provide great support for your primary message. For each message pillar, identify at least three convincing proof points, or reasons the target audience should believe what you tell them. Proof points may come from a variety of sources: actual statistics or data points from research or your customer base; product features and the benefits they deliver; customers’ success stories; and so forth. Their purpose is to provide evidence and add credibility to the messages you want to communicate. As marketers turn messaging into marketing communication artifacts, the proof points also provide ideas for marketing content: case studies, white papers, advertisement copy, and so forth. They help fill out details around the messaging story you are telling to your target segment(s). Finally, add a call to action. A call to action is an instruction to the target audience about what you want them to do, once they have heard and digested your messages. Usually it is an imperative verb: Register now. Try this new product. Visit this place. Vote for this person. Although each individual marketing communication piece you create for an IMC campaign might have its own specific call to action, it is helpful to decide on an overarching call to action that identifies the behavioral change you want to incite in your target audience. This call to action serves an important role of making sure that the messages do a good job of convincing the target audience to change their behavior and do what you want them to do. If the messaging doesn’t seem powerful enough to convince people to take action, you need to revisit the messaging and make it more compelling. The primary purpose of message architecture is to help you make sure that everything you communicate ultimately ties back to the major points you want audiences to know and believe about you. As you finish filling out your message architecture, review it and check for alignment at each level. Each level of the architecture should provide consistency and support for the other levels. If you spot disconnects, work to refine the messaging so there is strong alignment. After completing your message architecture, set it aside for a day or so. Then come back and go through the following checklist. Make revisions and refinements where needed. Alignment: Recheck your messaging for alignment. Make sure all levels of the messaging framework are consistent with one another. Hearts and Minds: Identify where your messaging is working at a rational level and where it’s working at an emotional level. To be compelling enough to spark a change in behavior, it must appeal to both. Strategy: Confirm that the messaging complements your organizational, marketing, and brand strategies. If it isn’t getting you further along those paths, it isn’t doing its job. Differentiation: Review your messaging with competitors in mind. Your messaging should set you apart and express messages only you can credibly own. It should be more than just “me, too” catch-up to the competition. Tone: When you read your messages out loud, your language should sound natural and conversational. Your messaging should ring true; it should sound like it genuinely comes from your organization and the people who represent you. Clarity: If parts of your messaging sound vague or unclear, look for ways to reword them to make them more concise and concrete. People hearing the message should easily understand exactly what you mean. Inspiration: Your messaging should motivate and inspire your target audiences to take action. If it isn’t compelling enough to do that, you need to make it stronger. Once you have completed your messaging framework, test the messages with colleagues and internal stakeholders, as well as with members of your target segment(s). You can do this formally using marketing research techniques, or you can test the messages informally by using them in conversations and gauging whether they produce the desired reaction. Testing helps you figure out quickly what’s working and where there is room for improvement. Once your messaging framework is complete, you can apply it immediately to marketing campaigns and IMC activity. You should revisit the messaging periodically to make sure it’s still having an impact on your target audiences and helping you achieve your goals. The simple messaging framework shown in Figure 1, above, is easy to use for a variety of different messaging purposes. It can also easily be adapted to include other elements that marketers decide are important to the organization and alignment of messaging. 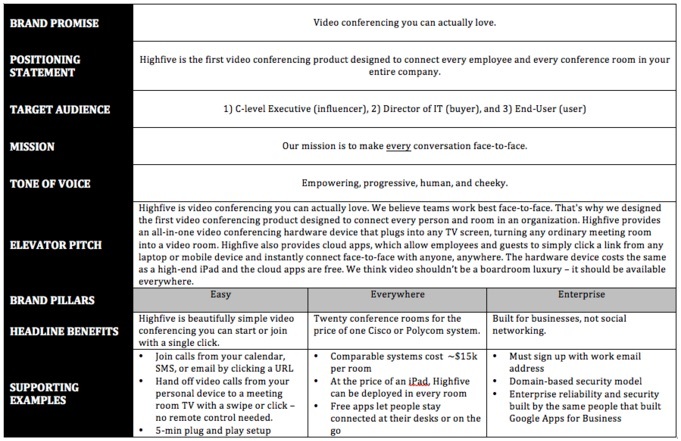 Figure 2, below, illustrates a messaging framework for Highfive, a video conferencing company. The goal of this messaging is to convey the central value proposition of the company and its conferencing product, and it demonstrates good alignment across different components of the messaging. In this example, marketers have left out the call to action, but they have introduced other components around which they want strong alignment: the company mission and brand voice. 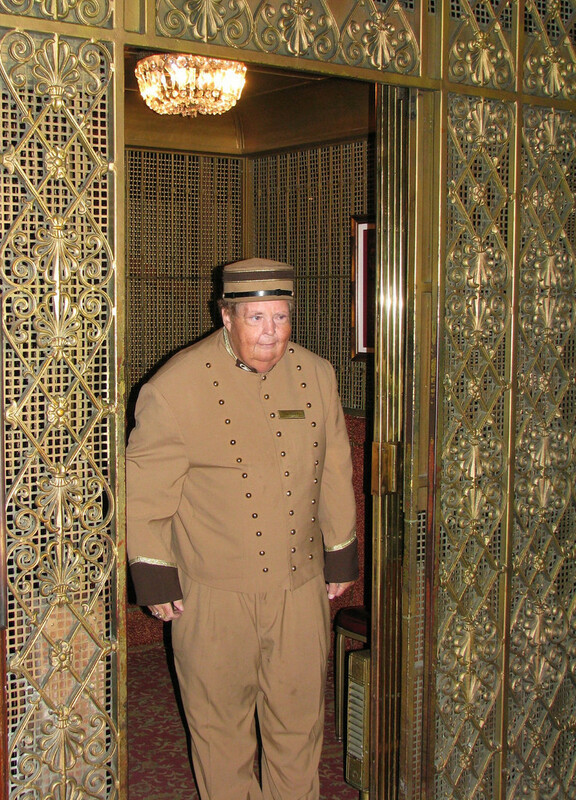 The rather long elevator pitch is well supported by clear, compelling message pillars, and the messaging offers ample proof points in the form of product features that substantiate the messaging claims. The messaging itself offers both rational reasons to believe the message (e.g., “simple conferencing you can start or join with a single click”) and emotional benefits to inspire action (e.g., “video conferencing you can actually love . . .”). Finally, the overall tone of the messaging demonstrates strong alignment with the company’s brand identity. Answer the question(s) below to see how well you understand the topics covered in this outcome. This short quiz does not count toward your grade in the class, and you can retake it an unlimited number of times.